ANCHORAGE, Alaska (CNN) — Republican vice presidential nominee Sarah Palin abused her power as Alaska’s governor and violated state ethics law by trying to get her ex-brother-in-law fired from the state police, a state investigator’s report concluded Friday. “Gov. Palin knowingly permitted a situation to continue where impermissible pressure was placed on several subordinates in order to advance a personal agenda,” the report states. Palin and her husband, Todd, have consistently denied wrongdoing, describing Wooten as a “rogue trooper” who had threatened their family — allegations Branchflower discounted. “I conclude that such claims of fear were not bona fide and were offered to provide cover for the Palins’ real motivation: to get Trooper Wooten fired for personal family reasons,” Branchflower wrote. The Branchflower report states Todd Palin used his wife’s office and its resources to press for Wooten’s removal, and the governor “failed to act” to stop it. But because Todd Palin is not a state employee, the report makes no finding regarding his conduct. Is the govenment doing anything for the common man whos on the street because of the financial crisis? Is the governemnt here to bail out big companies only and not the common man who is on the street? Why are profits privatized and tax payer money is being used to bail out companies which no other private comapny wants to buy? Between the $29 billion the Fed pledged to swing the Bear Stearns sale to JPMorgan in March, $100 billion apiece to rescue mortgage finance firms Fannie Mae and Freddie Mac, up to $300 billion for the Federal Housing Authority, Tuesday’s $85 billion loan to insurer AIG and various other rescue deals and loans, taxpayers are potentially on the hook for more than $900 billion. Why is that no one is punishing heads of these organization who are responsible for this crisis? 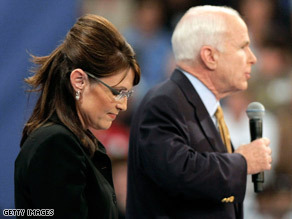 CNN’s poll of polls had earlier shown that Palin was the driving factor behind John McCain’s lead over Obama. (McCain leading 47 to 45 on 8th September). But it seems the Palin effect is over and Obama is back in the lead (47 to 44 18th of September). Palin’s favorable rating is at 40 percent, according to a CBS News/New York Times poll. That’s down 4 points from last week. Her unfavorable rating is at 30 percent, rising eight points in a week. Economy is the fundamental reason behind this change . McCain said Monday that “the fundamentals of the American economy are strong. Probably not a smart thing to say on the day of financial meltdown. Most Americans see Obama as more capable than John McCain when it comes to handling the economy, polls show. Also “Thanks but no thanks to bridge to Nowhere” comment has angered many Alaskans and people are learning that she had earlier supported the bridge . Former Bush adviser Karl Rove predicted Wednesday that Palin’s star power would wear off.